Cast Bronze. 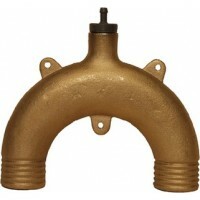 Size: 6-1/4" W x 7" HHose: 1-1/2".. Cast Bronze. Size: 2-1/2" W x 2-1/4" HHose: 3/4"..
HVL series vented loops are for hose connections.The oversized vent valve is virtually clog-free, an..
An essential accessory to prevent water from siphoning into toilets that are installed below a vesse.. Eliminates fluids siphoning from one tank to another. A top mounted valve allows air to enter when n..